One of our favorite things is to sit outside on the back porch on a nice cool night and read a book while the chickens cluck themselves to sleep and the garden pond trickles in the background. But sometimes you just want to listen to your favorite jams while hanging out with friends, so I set out to install speakers in the backyard. I found out that there are tons of ways to accomplish this, from trendy looking waterproof speakers to hidden rock speakers you put in the landscaping, but these require running cable through conduit buried under the yard and that was just too much to try to pull off in the heat of a Texas summer. The solution needed to be wireless. 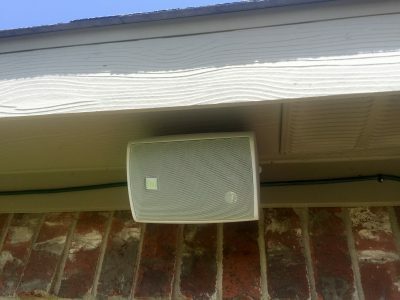 I decided to keep it simple and grab some small 4″ weatherproof speakers off Amazon and hang them up under the eaves of the house and wire them through the eaves, into the garage attic, and connect them to an old amplifier I use out in the workshop when I’m building things. After a few days of trying this out, I realized how much I had come to rely on being able to change the song from my pocket with the Airplay speakers inside and how I really missed that ability when listening to a song I don’t love on a playlist. (#firstworldproblems). Back to doing research. One option is to create another airplay speaker setup, which is easily done with an Airport Express ($100), a raspberry pi ($~60) running an airplay server (which I’ll cover in a future post), or an old unlocked iphone (? ), but I wanted to try something new. I found this world of small, credit card sized audio amplifiers running about $15 that run stereo speakers (2.0) at 50W each. It kind of blew my mind. I thought there was no way that a credit card sized chip could actually be more powerful than the 2′ square box that is the old 1970’s amplifier currently sitting in the garage, but it turns out that it certainly is. Of course, it cant play cassette tapes, but I’m willing to let that slide since I can wirelessly play spotify. You’ll need a pair of outdoor speakers. Weatherproof if you hang them under some kind of protection; waterproof if they will be out in the open. 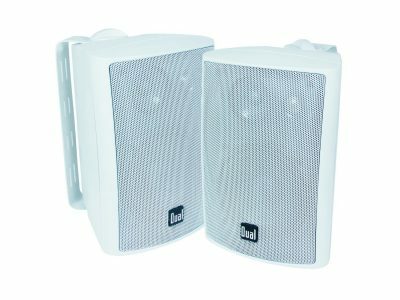 I chose the LU43PW 100W 3-way speakers by Dual since they have great reviews, have a solid 50W RMS rating (RMS=continued sustained power level), and were less expensive than similarly rated speakers from brand name companies. They are currently $34. They have a 4″ woofer, a 40mm mid range cone, and a 20mm tweeter. So far, I love them. We’ll see how they hold up in the long run after some spring storms. 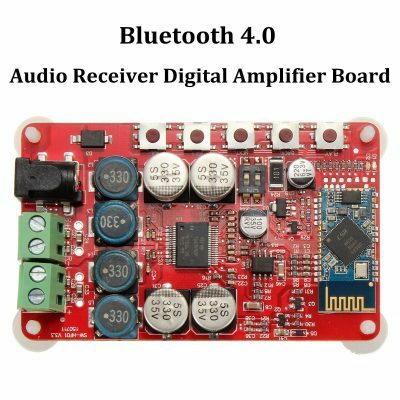 You’ll also need a bluetooth amplifier board. After some digging, I got the INSMA 2x50Watt Dual Channel Amplifier with Bluetooth 4.0 Audio. These currently run at $19. 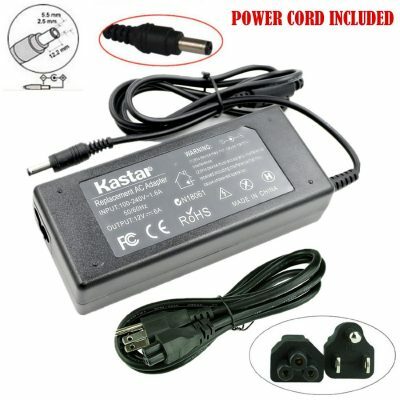 Power requirements are 2.1 amps at 8-25V DC. The minimum is 2amps, but if you supply more, you can get more max volume. Amazon reviews suggest 6amps can max the thing out. You can use speakers with impedance anywhere from 4 to 16 ohm, but 8 ohms works best. Alternatively, you can get this Nobsound HiFi Bluetooth 2.1 Board that has support for a subwoofer. 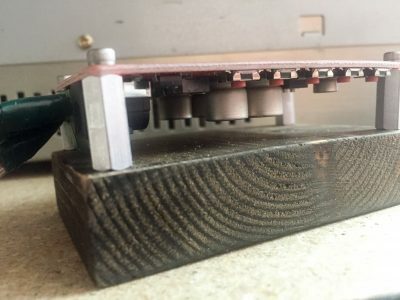 Its a bit more expensive, but connecting an outdoor subwoofer might be something you’re into and this what you should use instead. A power supply. This one is recommended as an addon purchase when you get this board. Speaker cable. I generally grab a roll of 100′ and use it for all kinds of stuff, but you may need less if you can put the amplifier close to the speakers. I used about 25′ total to run two lines from inside the garage, through the attic, and under the eaves of the house. A good pair of wire strippers. The following are optional and are used for a mounting bracket for the amplifier. Putting all of this together is really simple. If you’ve hooked up any speakers before, you can do this. Mount your speakers under the eaves of the roof with the included mounting bracket and run speaker cable into the attic behind it. The mounting bracket is simple and not pretty. Simple block of wood with electrical standoffs and screws through the holes to protect and hold up the electronics. I drilled a 1/2″ hole in the eaves of the house just behind the speaker and ran a long length of speaker wire up into the hole with a metal coat hanger bent straight. Tape the wire to the end of the coat hanger and run it up into the attic (or wall) and, once its up there as far as you can get it, go into the attic and you should be able to reach it. Our garage attic was 115 degrees, so I recommend doing this fast. This part was less fun. 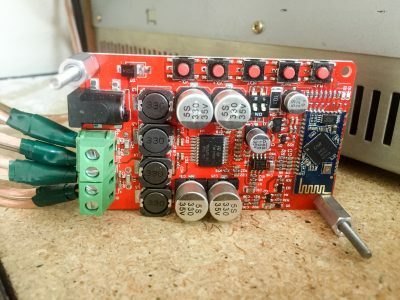 Finish off the cabling by running the wires to wherever you want the amplifier board to be mounted. I ran mine down the inside wall of the garage to a shelf I already had an old 1970’s amplifier sitting. The board with speakers attached. I used small bits of electrical tape to make sure the connections were separate because they are so close together. Install the speaker wire into the board spots. Be careful to note + and – on each speakers. They are not in an intuitive order on the board. The order is L+, L-, R-, R+. I built a small mounting bracket from a little piece of 1x wood left over from another project. I cut it just bigger than the board, put a little stain on it so it didn’t look quite so rough, and drilled 4 holes that match the mounting position of the holes on the amplifier board. I used 4 electrical standoffs and 4 wood screws to hold the board to the amplifier and protect the connections. Power the board up with the power adapter and you’ll hear some funny noises from the board checking the outputs and the bluetooth chip, and the LED will begin to blink when its ready to be paired and receive audio. Grab your smartphone, head to bluetooth in settings, and you should see a new option. Mine said “SHUNUO Audio”. (I haven’t figured out how to change this yet.) Click that new source to pair and connect. 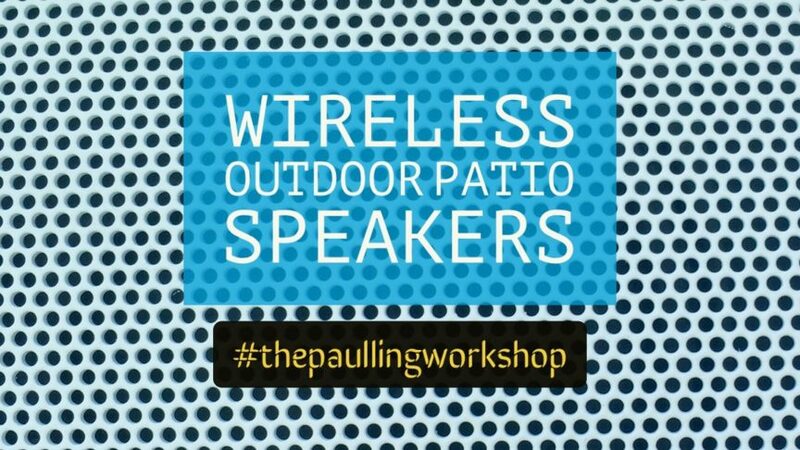 Pull up your favorite music player (Spotify, Pandora, Apple Music) and start playing wirelessly to your new outdoor speakers!